Fortunately, storm damaged boats are fairly easy to discover. All he has to do is to be particularly alert, and approach every survey that he performs with this possibility in mind. There are a lot of these boats out there. Many of these boats were totaled out by the insurance company and sold as salvage. Many were bought up in large numbers by salvage speculators who are in the business of restoring and reselling. Very large numbers were repaired under insurance claims. Some were simply purchased by individuals looking for a bargain or a project where repairs were ultimately made by an amateur. In any case, the repairs were just as likely to have been poorly accomplished as not. This is not to suggest that all storm damaged and repaired boats have faulty repairs. I personally know of many speculators who performed quality repairs. On the other hand, I know of some who are so unscrupulous that they attempted to cover up damages rather than make repairs. There are a lot of these out there, too. Hull damage is rather easy to spot because it is so difficult to restore damaged hull surfaces to their original contours. Only the most highly skilled repairers are capable of making a hull repair, say on the hull sides, so well that some evidence of the repair is not visible. This is especially true on boats where the gelcoat finishes were repaired. Precisely matching gelcoat color is nearly impossible so that, after just a few years, discoloration or mismatched colors of the repaired area are usually a dead give away. Another potential indicator is a hull that has been painted, particularly a late model boat where there is no apparent reason for the painting. Always suspect boats that have been repainted and investigate carefully. Painting a hull yields a much higher gloss than gelcoat, and this higher gloss will reveal the imperfections of a repair more readily than gelcoat. Sighting a hull is an important part of the survey. To sight it properly one needs good lighting conditions. If a boat is hauled out inside a covered building, there's a good chance that the lack of light will inhibit the surveyor's ability to detect repaired areas. To sight the hull, one needs to utilize reflected light off the hull sides to show up imperfections. This is done by moving around the hull in such a way that you observe the bottom and sides by this reflected light method. It involves sighting down the surface of the hull at an angle nearly parallel to the surface, so that a fairly large area is showing a reflection. And it is this reflected light that best shows up irregularities in the surface such as grinder marks or poor fairing. The bottom, particularly painted bottoms, are most difficult. But then the bottom is where the repairer usually does the poorest work because it is hard to reach. On the other hand, the surveyor rarely has good lighting conditions on the bottom so that it is here that he needs to be extra careful. Make sure that the boat gets lifted up high enough that you've got good light and unobstructed visibility. Be especially alert for grinder marks and poorly faired surfaces. Once repaired areas are discovered, sounding the hull sides out will give an indication of whether repairs were properly made. I do not recommend using a plastic hammer to do this as plastic against plastic does not give the best audible result. Using a large coin or medallion is much better at detecting subtle changes in the density of the material. It can often show up soft fillers where the plastic hammer won't. Examination from the interior, if there is any access at all, will often tell the whole story. Often the repairs are made without repainting on the interior and the method of repair will be apparent. Or it may be repainted, but the paint is so fresh that the repair still shows up, as fresh paint on the inside of an older boat is a dead giveaway. Also look for fiberglass dust and other debris that may not have been removed. If the repair looks sloppy, I then go back over the exterior with my coin, sounding out the entire hull surface area looking for delamination or large areas that were filled with putty. What I'm most concerned with are areas where the reinforced plastic was not returned to its original structural strength. Many times a shoddy repair will not restore damaged laminate, but merely cover it up with fairing, thus leaving a very weak area that is likely to fail at a later time. This is precisely what I most want to avoid. One problem with this is that some of the highest quality fillers are very hard and may not show up any audible change in sound. Fortunately, someone who short cuts repairs is not likely to use this very expensive material, but rather cheaper materials like Bondo or other auto body materials which are soft enough that they do show up. If they use the hard stuff, I'm stuck because I can't tell. In that case, the best I can do is write it up in as much detail as possible and then declaim responsibility for determining the effectiveness of the repair. Examine the decks and superstructure with the same degree of care as the hull. For if substandard repairs are likely to appear anywhere, it is here. Use the same sighting techniques as for the hull, being alert for grinder marks and general unfairness. The hull to deck joint is another area where short cut repairs are most likely. Examine the sheer line carefully, looking for evidence of filling and unfairness. If at all possible, try to inspect the deck joint from the interior. Stress cracks and numerous loose screws in the rails may indicate that the area is weak. Or there may be a condition where many of the deck fasteners are all broken loose as a result of the vessel hitting against pilings. Signs of excessive leaking on the interior may foretell this situation. Corrosion in, on or behind electrical panels, terminal blocks and other electrical components where there is no other explanation for the existence of corrosion except sinking. Interior hardware: look for rusty steel hinges, lighting fixtures, screws inside cabinets, drawer slides and other corroded hardware that was not replaced. Water stains on bulkheads, partitions. Examination of raw wood behind interior structures will usually leave clear evidence of a boat that has sunk. Often times the water lines are clearly apparent. They are usually to be found in areas that are hard to reach. An older boat with too many new replacements. How else does one explain an older boat where everything is new? Older boat is too clean and has virtually nothing personal on it. When there are no signs of anyone having owned the boat, one has to wonder why. While it is not the surveyor's responsibility to research the past history of the vessel, he does need to do something to protect himself. 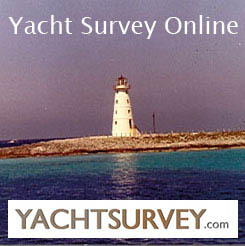 Many times a survey will reveal suspicions of sinking or other serious damage that may be hard to prove. Making such an allegation without being able to prove it could cost the surveyor dearly. So could finding obscure evidence but not reporting it. So what to do? The only solution for this dilemma that I know of is to do an extra good job of surveying the boat. I've run across more boats that have had good repairs than bad. I've had cases where there were indications of the boat having been sunk, but not incontrovertible evidence, just hints. The only thing I can do is to look extra close. If there is no clear evidence and everything performs up to standard, then the best I can do is to advise the customer of the possibility, of my suspicions, and to state that I can't prove it. If I can point to specific evidence, then I feel that I have to write that up in my report, but only after photographing it and documenting my file thoroughly. I adopt the attitude that whatever I say, I have to be able to successfully defend my words in court. If I wouldn't be comfortable saying it on a witness stand, then I don't say it. But whatever I do say, I make sure that its totally accurate and verifiable. Every year I run across at least a half-dozen boats on which I detect storm damage. Most of these are properly repaired. Whether or not a surveyor has an obligation to report these facts, or suspicions, to the buyer is a tough question to answer. When it comes to late model and very expensive boats, I find it very rare that repairs were not properly made. Usually they were so well done that only an expert could detect them. If I am totally confident that the repairs were first rate, more often than not I do not inform the customer. My reasoning is that to inform him of prior damage is often very stigmatizing and could kill the sale for no valid reason. Properly repaired damage is not a defect, and does not affect the value of the vessel, except possibly in the mind of a non expert. The difficulty with reporting properly completed repairs in the report is that it is likely to draw the suspicion of the lender and the insurer. They may reject the vessel or loan based only on your comments that they wrongly interpret. Or, they may come back and ask you to state that the repairs were properly made. Now you're in a box because you don't know how the repairs were made; you're only evaluating based on what you can see. And you can't see inside the laminate. So to make that statement in writing is to start sawing the branch that you are perched upon. The degree of severity of prior damage is the main criteria that I use for making my decision. That, and whether the repairs are detectable by anyone other than myself. If, for example, a 52' Hatteras had a substantial hole in the hull side, or major hull/deck joint repair work done, then I'd probably feel obligated to inform the customer, to protect myself and him. If the hull sides had just been banged and scratched up, then probably not. I draw the line between minor, moderate or major repairs. If the repairs are readily detectable, then I feel that I have to tell him. Chances are that he will eventually find out anyway, and he may be very unhappy that I didn't tell him. Great works of art such as very old paintings have been repaired and restored so many times that of the original painting, there's not much left. That does not reduce their value. Houses and buildings have major roof damage and repairs all the time. Cars and other vehicles are also routinely repaired without the requirement for disclosure. The legal requirement for disclosure is based on the propriety of the repairs. A person can be held liable for knowingly selling defective merchandise. The surveyor is held to essentially the same standard. Probably the best way to answer this question is to determine whether there is any possibility that the condition could result in an economic loss to the client. If it could, then the condition must be disclosed.